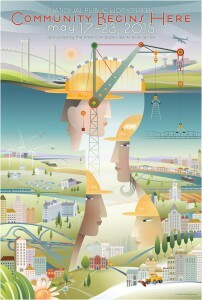 May 17th through May 19th marks National Public Works Week. The American Public Works Association started National Public Works Week in 1960 as a way to educate communities on the vital role that public works play in their daily lives. The development and maintenance of our local parks, facilities, and infrastructure lie in the hands of the more than 28,000 public works employees across the nation. National Public Works Week gives those hard-working individuals well-deserved recognition for their commitment to our communities. The official 2015 National Public Works Week poster. Public works professionals face many challenges while performing their duties, the most debilitating and universal being limited budgets. Recent data shows that public works funding is inching towards recovery (see “Cost Saving Options for Public Works Departments”), but the current financial needs of public works departments are not being met. This deficit has contributed to an even larger issue: the state of U.S. infrastructure. In a Public Works Magazine poll, 66 percent of respondents said that their department’s biggest challenge was infrastructure related—street maintenance, wastewater treatment, and stormwater pipe maintenance and rehabilitation. The maintenance of infrastructure is crucial to the function and prosperity of any society, the very existence of public works departments is an acknowledgement of that truth. But the lack of funds being provided for infrastructure maintenance and repair makes the government look like children clenching their eyelids shut and sticking their index fingers in their ears to avoid addressing this epic failure. In the American Society of Civil Engineers’ (ASCE) 2013 Infrastructure Report Card, the U.S. received a D+ overall on our bridges, roads, dams, and rail systems. They also estimated that a 3.6 trillion dollar investment is necessary to fix our failing infrastructure by 2020. According to the Congressional Budget Office, in 2014, the federal government spent $96 billion on infrastructure, alarming when compared to the ASCE’s findings. The underfunded Highway Trust Fund is a primary example of the Government’s neglect. The federal gas tax, from which 60 percent is contributed to the Highway Trust Fund, has stalled at 18.4 cents per gallon for the last 22 years. When you factor in a recession, the emergence of more fuel-efficient vehicles, and increased use of public transportation, the income generated from the tax does not come close to covering the needs for the US Highway System. Recently, there were attempts to fix the Highway Trust Fund, like the Repatriation Tax and a revived call to raise the gas tax. But these efforts have proven pointless in a divided Congress. Even if the Highway Trust Fund is restored, it will only address streets and bridges. Public Works Departments will still rely, heavily, on inadequate local resources to fund their stormwater, wastewater, and other infrastructure projects. So here’s an idea to celebrate this year’s National Public Works Week, contact your Congressman or Congresswoman and let them know that you support increased funding for U.S. infrastructure.